An odd little album, this, from a band who, at the time, nobody quite knew what they were. They weren’t punk, they weren’t rock. They had a few 50s style rock n roll stylings. They weren’t “new wave” yet, because it hadn’t been conceived of, similarly “power pop”. 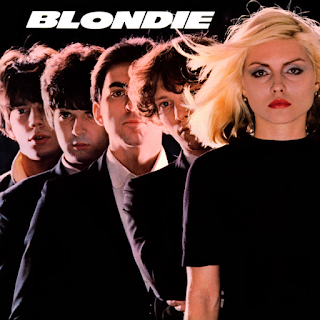 Dominated by keyboard player Jimmy Destri’s fairground sound Farfisa organ and drummer Clem Burke, funnily enough, blonde bombshell vocalist Debbie Harry was not the most notable thing about the band’s sound. What was clear, was that, embryonically, they had something. Harry, for sure had a sort of Lower East Side tough girl with a romantic side image and a 60s girl group sensibility. The fifties diner fashion sound was there on the catchy and appealing “Little Girl Lies”, the rock 'n' roll ballad of “In The Flesh”, the "West Side Story"-influenced “A Shark In Jets Clothing” and the new wave sound in waiting came on the joyous blast of “X Offender”, “In The Sun” and the uber-bitchy “Rip Her To Shreds”. 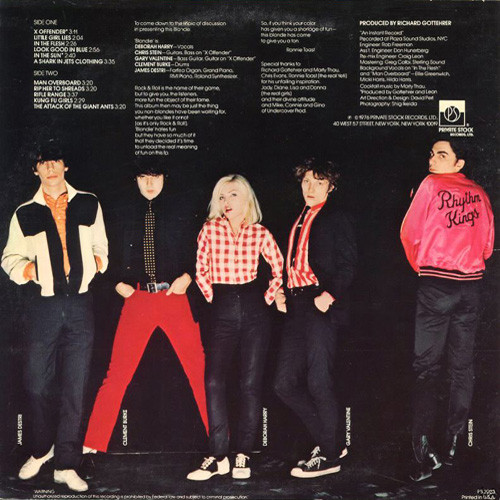 “Kung Fu Girls” is probably the album’s punkiest number, "Man Overboard" and "Rifle Range" are very much what would come to be known as "new wave", while the quirky “Attack Of The Giant Ants” showed the band’s liking for 50s horror “B” movies, but, unfortunately, little else. Not the best track they ever did. There is some ok stuff on here, but, to be honest, it is all over before it has started. Not much for your money. 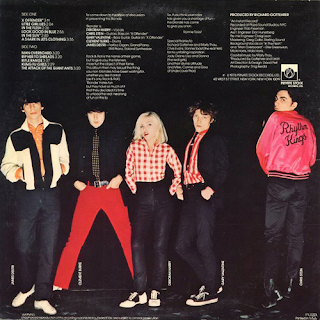 Fans of supposedly "real" New York punks like Richard Hell and The Ramones despised Blondie, which was somewhat unfair. Never mind, give it eighteen months and new wave would be here and they would briefly rule the world.